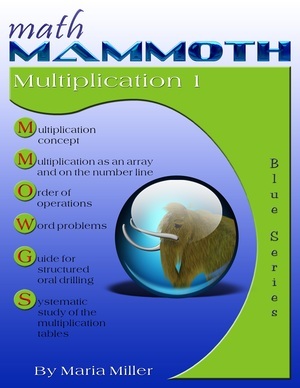 Math Mammoth Multiplication 1: Master the Times Tables. Self-teaching printable workbook. We always start the study of each table by memorizing the skip-counting pattern 7, 14, 21, 28, etc. first. Then we work on memorizing which fact is associated with which answer. This way your child not only knows what is 8 × 7 but also knows all of it “backwards” - that 56 is in the tables of 8 and 7. That knowledge will be an enormous help later, when the student learns division, factorizing, and finding LCM's or GCF's. The book also includes a 12x12 grid at the end of almost every lesson in part 2 (see an example). The boxes for those answers that have not been studied yet are shaded and are not to be filled in. Little by little, the shaded areas become fewer and fewer, and the progress is very visible to the student. I encourage you also to use games for motivation and for practice. I have included a list of online multiplication games for that purpose. Of course, board and card games work well also. However, games are not enough in themselves. The memorization also requires a mental effort from the student: sitting down with the skip-counting list, then with the facts, reading them, and then trying to remember them. The basic age-old technique of covering the list and trying to remember it is still very effective! The book Multiplication 1 is excellent for remedial teaching. I have made a set of videos to match the part of the book dealing with the various tables. You can access them here: Free multiplication tables videos. These videos not only explain how you can do the "structured drill" for multiplication tables, but also do the drilling for you! David Chandler from Math Without Borders has made a free online tool called Learn 'Em Forwards and Backwards that helps you practice and master the multiplication tables using the SAME order of learning the tables as in the book Math Mammoth Multiplication 1. What does it mean? For example, students not only learn the answers to 2 × 6, 3 × 6, 4 × 6, 5 × 6, etc. but also practice the missing factor problems: ___ × 6 = 12, ___ × 6 = 30, ___ × 6 = 72, ___ × 6 = 42, etc. Also, I wanted to mention that we have been doing the Blue Series "Multiplication" as our only math for about the last two weeks. We did another ITBS practice test (math only) at the end of last week, and I was astonished at the improvement! It seems that even his computation speed on the addition and subtraction facts has improved; we did not work directly on this, so I can only assume it must have something to do with the Math Mammoth worksheets. It seems to me that he is now thinking in a more mathematical way, if that makes any sense. He was even able to do most of the division problems they included, despite the fact that he has only seen the concept a time or two so far in his Saxon math. Before, he would just look at division and skip over it without trying, but he seems to have the confidence to at least try it now. My child is a slow learner (low IQ) and struggled with multiplication. His teacher had given up on teaching it to him and just wanted him to memorize the flash cards but it wasn't connecting for him. Your method has made such and incredible difference! (There are not enough exclamation marks that can stress just how amazing your book has worked for him.) He now has confidence in his math ability and he really understands the concept. I'm looking forward to the success he will have using your division math book! Thank you so much! Thank you so much for your products - I have only just started using the multiplication study and my son, who has been working on multiplication for almost a year, has finally "gotten it". We have been at it for a week, using your method of times table review and I am wonderfully pleased at how he has finally learned how to manage the times tables! Thank you, thank you, thank you! We love the books. My daughter developed a good conceptual understanding of the topics, as well as mastering the arithmetic facts. We are using it as the only curriculum to teach multiplication and division. I love the simplisity of the books. I also love that I see my child learn it with little difficulty. She was very apprehensive about learning multiplication due to the fact that her friends had told her how hard it was going to be. She started crying on day one. I promised her that I had overlooked the lessons and it would be a breeze but she was still upset until we came to the end of the lesson and she yelled out with a big smile on her face, "That's it, we're done! That was easy!" I recently downloaded the Blue Multiplication 1 book. Our third grader has used the SRA Math series called Explorations, but we had been unable to find some of the materials we needed. I needed something quickly to work on, and I decided to try focusing on one area, namely multiplication. Your math book has been a great way to kick off the subject. My son found your worksheets very easy to follow with directions that made sense to him. This is a huge advantage in homeschooling as I have 3 kids to teach, all at different levels. We still worked together at times, but he found that he could work independently as well. Explanations are clear and concise. The problems kept him engaged, but did not get too repetitive. I appreciated that some of the sections were difficult as it gave me a chance to work through multi-step problems together. From a teaching standpoint, I like that I can choose a subject to focus upon. I also found the access to the materials very convenient. Rather than having to go to a store, I could peruse the selection on line, and even look at samples. Once I made my decision to buy, I got immediate gratification! That is a huge bonus as we live in a very remote area and my access to educational supplies is almost nonexistent. I think that your gift is that you have a very clear approach that seems to strike a responsive chord with most children. You have helped me to step back from the idea of MATH as a huge beast we need to tame, and showed me that we can break it down into bite sized pieces. 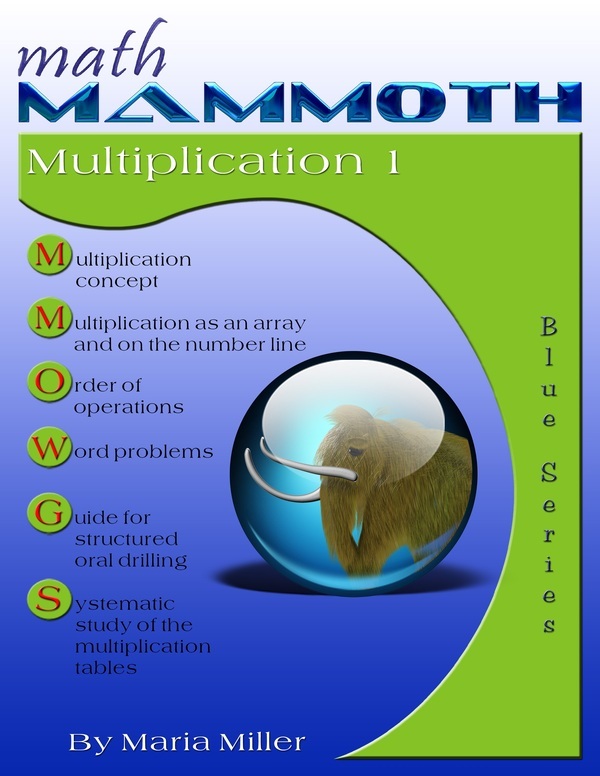 I discovered the Math Mammoth books while looking for resources to assist two students I tutored this summer. One was a rising third grader, the other a rising sixth grader. Both students needed to work on learning multiplication tables, so I purchased the Blue Multiplication 1 worktext. With my third grade student, we worked through the entire text over the summer. She had missed the introduction to multiplication during her second grade year because of absences, and never really caught on to what was going on in her math class after that. She came to me very frustrated with math, but the illustrations and examples in the worktext really helped me explain multiplication to her effectively. She entered third grade with most of her multiplication facts not just memorized, but *understood. * Her mother has commented on how easy math is for her this year! The rising sixth grader had struggled in math, I think because she needs a lot of repetition and one-to-one teaching to master any new skill, and the math program we use in the lower grades introduces a skill, and provides has just a few practice problems on that skill before moving on to the next topic--it just wasn't enough concentrated practice for her. She felt she was not "smart at math," but had chosen to seek out tutoring on her own over the summer to get ready for middle school. She was extremely self-motivated. We worked through most of the multiplication exercises over the summer--condensing the work in the first section somewhat because the concept of multiplication was very familiar to her--as well as the sample pages on fractions during the summer. The fractions models simply made fractions "click" for her--she got very good at visualizing fractions in her head based on the modeling and using that visualization to compare fractions. I will definitely be using these books with my own children, and have recommended them to several teachers, especially teachers working with special needs students. My granddaughter desperately wanted to learn multiplication tables. The memorization technique (rote counting) of just remember the numbers 3, 6, 9, 12, 15 etc wasn't working. My nieces who attended public school had been struggling with learning the times tables as well. It was a nightmare that both the children and I wanted to avoid so we did them with much pulling out of hair and teeth. Please describe how you have liked the ebooks. These books are sensational, writing the numbers, doing the practice exercises and the skip counting number lines worked miracles. The frustration was gone. We were able to make up lots of games using the books and the children learned really fast. I love the way the multiplication ebook has moved seamlessly from point to point. The teaching tips have been helpful! My son and I enjoy sitting down to do them. My son has been a very reluctant math-learner. He always says "It's just too hard." He has commented several times that he enjoys completing the multiplication ebook and doesn't want to skip pages. My daugher is ADD and has been all of her life. She mentally dropped out of school in the third grade. Now that she is older, she wants to recapture what she missed out on. She is very excited to be learning and understanding her multiplication and realizes it's not as hard as she originally thought. This workbook is awesome! He is learning his multiplication facts easily and very quickly. It works great as a curriculum by itself with no need to supplement with another math curriculum. I love how the books finally teach the rationale behind multiplication and not just memorizing the facts! I believe the books are very good in their current form. The format and content is very logical and clearly presented. great - very well-thought out. The concepts are very clear, layout is nice. The student really understands the information - you can't just regurgitate some memorized facts - the knowledge is applied to the questions and excercises. I have to say that I am loving your e-book on multiplication. I have tried to teach my son multiplication for 3 years now and he is FINALLY getting it! I like how you show the different ways to solve the problems. It is finally making sense to him. I'll be purchasing the one on division soon. Thanks for making these e-books, they are wonderful.